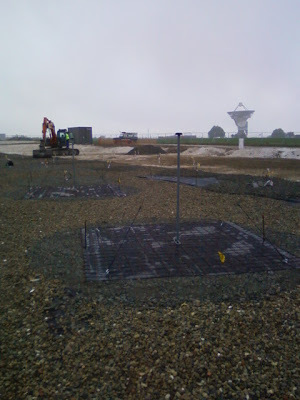 This photograph was taken at Chilbolton this morning, after the first two LBA antennas were installed yesterday. There was a light drizzle of rain to settle the dust and put some drops over the new antennas. But two antennas do not make a radio telescope and even once the field is complete with all 96 LBA antennas, there will be a lot more work to do. However, it is a nice opportunity to pause and reflect on how far the installation team working at Chilbolton (as well as all the other people working hard to bring LOFAR-UK to reality) have managed to get.